In business schools nationwide and in the upper ranks of corporate America, women are underrepresented. 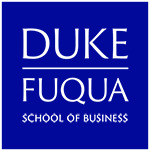 The Fuqua School of Business knows it’s time for a change. As a leader in business education, Duke is dedicated to building a diverse learning community that affords each woman the opportunity to reach her highest potential. The Duke MBA Weekend for Women event offers all prospective female students a unique opportunity to sample Duke in the company of other women and like-minded individuals — from peers considering business school to current MBA students and leading faculty and alumnae. The entire Duke community, not just our female community, is committed to diversity, and thus, the weekend event is open to all individuals, regardless of gender, who share our goals for a diverse community. Student members of the Association of Women in Business host the 3-day weekend, and last year, approximately 30 alumnae attended to share their educational and professional insights. We are committed to building and sustaining a multicultural and intellectually diverse environment by celebrating and valuing diversity in all its forms – opinion, background, work experience, age, ethnicity, gender, race, belief, and talent. We believe you learn the most from people who see things differently than you do. Your Duke MBA experience will shape your worldview and foster a mindset open to different perspectives, new ideas, and innovative solutions. That openness is one of the most valuable legacies we impart. It is why the entire Duke community has a long-standing commitment to diversity, and is a key reason companies choose to recruit at Duke.